1. 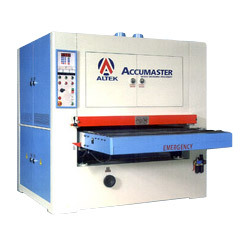 The machine frame is manufactured of heavy duty steel plate to minimize vibration and deflection. 2. All parts of the machine can be easily obtained for maintenance and service. 3. Under the sanding aggregate and the pressure rollers. It's the stable feed table. 4. Around the table, it runs an endless anti-slip conveyor belt. 5. The drive is powered by a strong feed motor and a varible speed control from 4 to 16 meters per minute. 6. The conveyor belt is adjustable with an auto tracking unit. 7. The sanding belt runs around the contact drum and the tension(or idle) roller. 8. The tracking of the sanding belt is achieved by an electric-eye. 9. Suitable for heavy process on laminating board and solid wood. 1. Specifications: 600mm, 915mm, 1100mm and 1300mm. 2. Combination head: single belt, two belts and three belts. 3. Model: economic model, standard model and heavy duty model. We have so many types and categories. Besides the standard specifications, we have some special outfit available for clients’ production requirements. We’ll provide you with appropriate models and specifications, and continue researching and developing in order to satisfy clients’ demands.